West Seattle resident Christine Mackay organized a trip through her non-profit Crooked Trails to bring a soccer field to the remote Andean village of Vicos in Peru. West Seattle resident Christine Mackay believes that travel should have a purpose – that a journey to a faraway place can become a trek centered on giving back. In fact, she’s so passionate about turning adventures into opportunities to build community and avenues for educational outreach that she created a nonprofit around the idea called Crooked Trails. 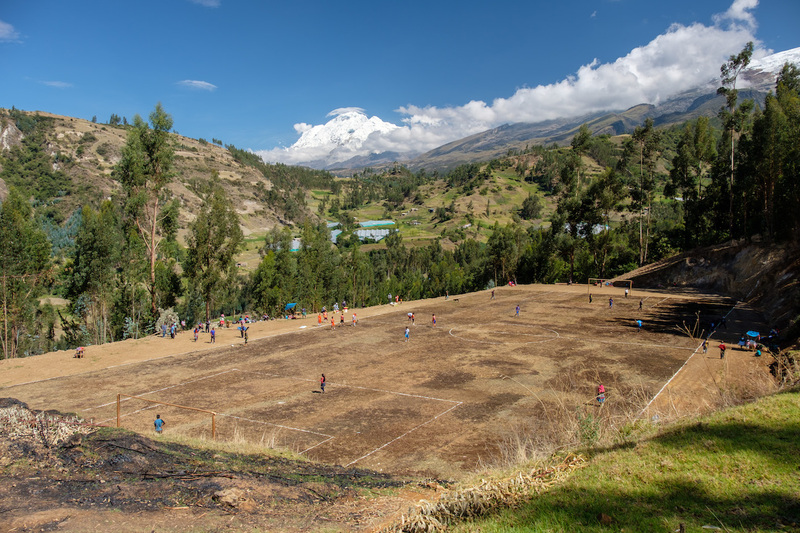 The inspiration for the name came from author, environmentalist and activist, Edward Abbey’s line, “May your trails be crooked, winding, lonesome, dangerous, leading to the most amazing view.” Mackay recently organized what she called a “trip of a lifetime” – inviting guests to build a soccer field in the remote Andean village of Vicos in Peru. She dreamt up the idea of building a soccer field on a trip a couple of years ago. And bringing a soccer field to a place where one does not exist could bring a lot of joy to a community, Mackay decided. “What I needed were rock stars,” she said. She thought having a professional soccer player join the trip would make it more enticing to travelers. Then, serendipitously, she connected with Elli Reed and Lauren Barnes of the Seattle Reign team. The two professional players offered to partner on the trip – signing up to lead soccer clinics and spend time with travelers. When the journey neared, Barnes was not able to go, but Kendall Johnson of the Portland Thorns took her place. In late November, six families gathered for the trek to Vicos, where they would stay with Peruvian families and learn about the culture of their hosts. Mackay also went on the trip – and brought her daughter Trinity who attends West Seattle Middle School and Mae Wentz, a student at Madison Middle School. Funding for the soccer field was sent in advance – and villagers were already at work clearing the site when the group arrived. The travelers quickly joined in the effort. “We spread manure, planted trees to stop the soccer balls from rolling down and put the lines on the field,” Curt Gerston said. Gerston, who teaches at Madison Middle School, went on the adventure with his wife Laura McCarthy, a teacher at West Seattle High, and their two daughters Lucy and Molly Gerston. After the field was complete, Gerston’s daughters played soccer with the other travelers in a game against Vicos residents. “They clearly enjoyed having a chance to play, and everyone had big smiles on their faces,” he said. Astrid Kopsch and Preston Poythress brought their daughter Annika Poythress, a student at West Side Middle School, along for the trip. “Our daughter is a soccer fanatic and very accomplished player,” Poythress said. When Mackay, a longtime friend, approached these frequent travelers about the idea of building a soccer field in Peru, they immediately jumped on board and helped plan the adventure. Poythress said that seeing the field go from dream to reality was a gratifying experience. The Gerstons extended their stay in Peru to six weeks – and said the time with Crooked Trails was the highlight of their journey. Mackay still has to raise about $8,000 to complete the project. She plans to duplicate the trip to finish the field – and also wants to bring soccer fields to other parts of the world in the future. “We still have more left to do,” she said. Crooked Trails fundraises year-round in support of a variety of causes, from building schools to combatting sexual slavery. To learn more, visit www.crookedtrails.org.